Our Elite Premium Folding Camper Covers are made of durable, UV treated materials. 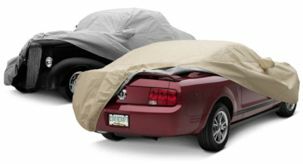 The top is a 4-layer non-woven fabric that is waterproof and will keep out rain and snow while a special venting system inside helps water vapor and condensation evaporate. It will protect a camper against rain, snow, UV rays, dirt, nicks and scratches. The integrated air vent system, combined with the 4-layer top and strong single layer sides will reduce wind stress and vent inside moisture. Adjustable front and rear tension panels combined with elasticized corner hems will help provide a great custom fit. There is a FREE storage bag included and an Incredible 3 Year Warranty. The overall length is measure from the back to the front of the camper but not the hitch.